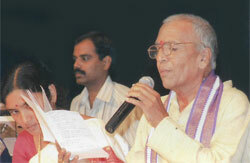 Dr. Mahabhashyam Chittaranjan a living legend in Telugu light music, was born in 1938, 25th of August . 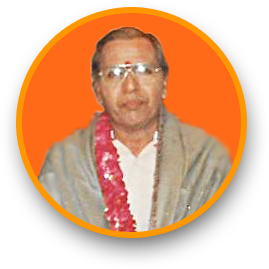 His father Sri. 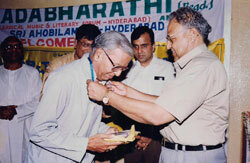 Rangachary was a retired chief engineer of All India Radio. He was a great devotee of Sri Shirdi Sai Baba and inherited deep spiritual thinking from his fore fathers. His mother Smt. Perin Devi was a musician and could play veena, violin and harmonium. Chittaranjan, eldest son of the family was raised listening to his mother”s songs and at a very tender age could sweetly repeat whatever his mother sang. Inauguration of "Sangeeta Manimanjari" Songs Album Sung by Smt. Vijayalakshmi Desikaan and Website Launching of Dr. Chittaranjan on 20-5-2018 at Sri Thyagaraaya Gana Sabha (Main Hall), Hyderabad. Copyright © 2019 Chittarajan Music World. All Rights Reserved.